We are within the orbit of outer Norwich, and the busy Cromer road is not far off, but All Saints graveyard is an oasis of calm, and it was a pleasure to be there on this bright Autumn morning. The church is set back from the lane, and by the time I reached the east end of the graveyard to take a sun-filled shot of the the chancel, the birdsong was louder than the noise of traffic, my peace only shattered by a large jet coming into land at the airport.. The Early English chancel is a pretty, rustic structure, with a thatched roof and neatly plastered walls, and the date 1703 picked out in a naive style with red tiles in the flint of the gable. 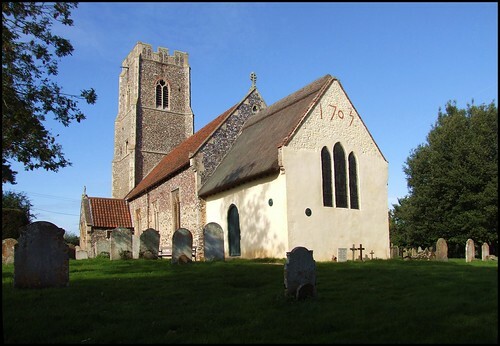 1703 was the year of one of the two great storms of that century; it destroyed much of the fishing fleet along the Norfolk coast, and so I suppose it is possible that the mending of the chancel happened in response to that storm. The storm took place in November, but in those days the New Year did not begin until March 25th, which might just have given time for a new gable. Another possibility is that the chancel had been fixed up earlier in that year, in which case the churchwardens must have been well pleased that their handiwork survived the maelstrom, and still survives for us to see today. The triple lancet window is unusual, not least because the plastering creates the effect that the windows are melting. The porch bears the very encouraging notice that this church is OPEN daily for private prayer, as all Anglican parish churches should be, of course. The lady cleaning inside confirmed that All Saints is open every day. As with almost everywhere in this part of Norfolk, the hand of the Victorians fell heavily here, and the small windows mean that this felt a rather gloomy interior even on such a bright day. But as my eyes became accustomed to the dimness I could see that this was a very well-loved and cared for interior. Not much survives of the medieval life of Horsford. The most significant remnant is a nice little screen, which must have been made right on the eve of the Reformation, and has been restored rather heavily since. There is also a big arcaded Norman font, and a cluster of 15th Century glass collected into a panel in the north aisle window. But the great star of the show here is East Anglia's best example of a 19th Century window by the grandly named Royal Bavarian Institute for Stained Glass, made by the Zettler workshop of Munich. It remembers three sisters, Edith, Dorothea and Nona Day, who died of consumption in 1891, 1892 and 1893 in Davos and Cairo. One sister stands on the far shore of the Jordan, welcoming her sisters across to a curiously Bavarian paradise, their halos looking like nothing so much as jaunty hats. Mortlock recalls that the Horsford estate remained in the hands of the same family from the Norman Conquest until 1973, when it was sold for the extension to Norwich airport. That family, the Barrett-Lennards, are remembered in memorials and heraldic glass. It is understandable that the Church of England has suffered a loss of nerve in some parishes in recent years, but to come to Horsford is to see another side of the story. Here, there is a brand new gallery at the west end of the nave, and it has been built to house an organ. It is in a thoroughly modern assymetrical style, and is obviously the mark of a parish which is mindful of its tradition, and is taking that tradition with it into the future. I found it hard to imagine that many parishes would have the confidence and motivation to spend money on such a project in this day and age, and I found that rather heartening.